It’s the dilemma of every cat owner: how to let Kitty enjoy the outdoors without risk of the Great Escape. The outside world can be a dangerous place for a roaming cat, with the threat of predators, cars, poison and diseases. Not to mention the danger to wild birds, which outdoor cats kill in monumental numbers. 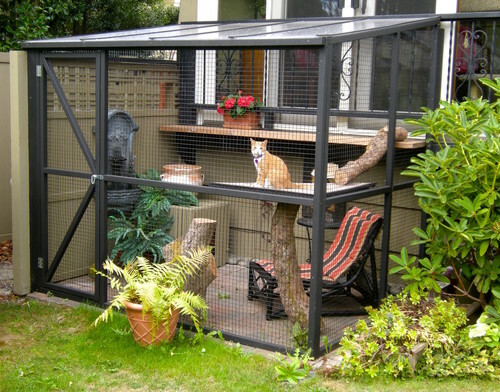 Catios — or cat patios — are safely enclosed playhouses for felines that provide fresh air, mental stimulation and exercise. Cats confined indoors are at higher risk for stress-related diseases, says Dr. Martine van Boeijen, a cat veterinarian in Perth, Australia. “An enclosed catio, which safely confines your cat to your property, allows your cat to have the best of both worlds.” Here is a basic guide on custom, kit and DIY options for adding a catio to your home. 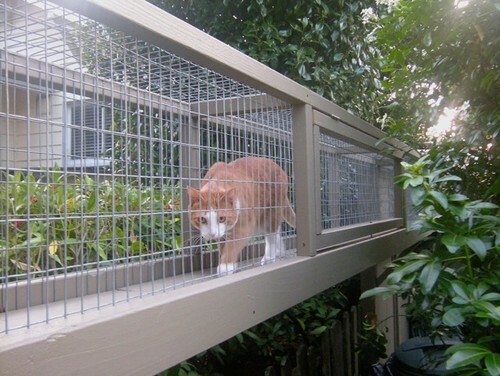 Catios can be as elaborate as a custom-designed feline jungle gym or as simple as enclosing a patio with screening. 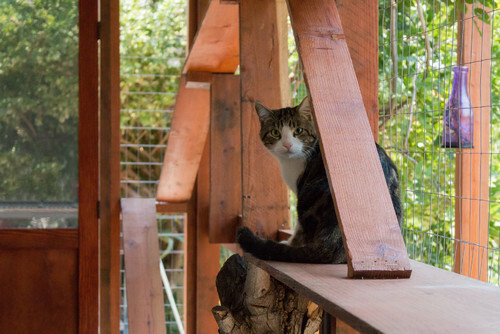 Here, Rasputin enjoys one of the perches in a custom catio built in Arcadia, California. 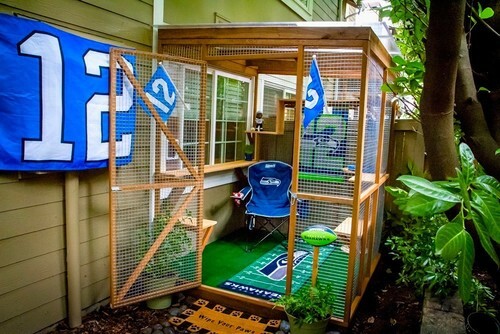 You can get as creative as you want with a custom-made catio. Some homeowners include ponds, cat-friendly foliage, chandeliers and even lounging areas for the humans. Unless you choose to design and build it yourself, the best pros to include are architects to design the space (unless you use a pre-designed kit) and carpenters to build it. Room to climb. 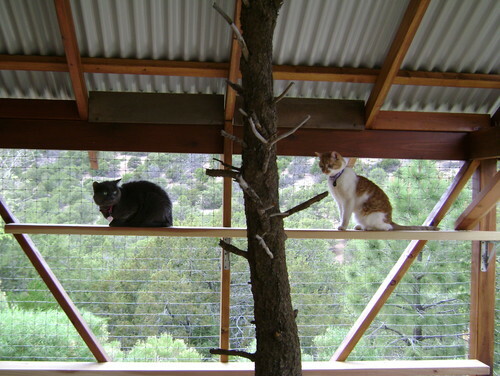 Above, Boris and Gabriel lounge on one of the many perches in a Santa Fe, New Mexico, catio custom-built by architect Greg Reid of Plan A Architecture at his own house. The tree is for scratching and climbing. The screening is two-by-two kennel fencing from Lowe’s. Reid used eight four-by-four cedar posts set into concrete-filled holes for the structure, with two-by-two fir beams and rafters. The roof is corrugated steel panels left over from the house construction. Cats like exploring vertical space, so Reid added a series of ledges. “Ours seemed to like to move from one area to the next without going down to the ground, so the two sides are connected by ramps that go up and over the top of the doorway,” Reid says. For cats and dogs. For this custom catio in Arcadia, California, Diana Vierra of Finesse worked with a sketch from the homeowner to create a space for the client’s border collies and rescued cats. 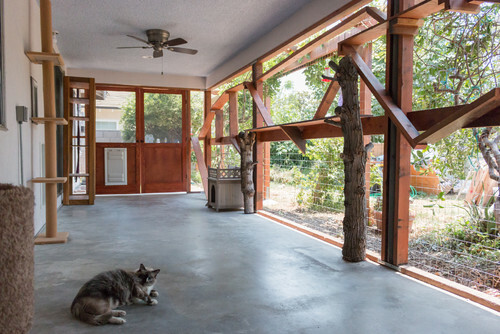 Here, Catarina lounges on the cool concrete floor in the 400-square-foot catio. Fans were installed for additional cooling. The cats enter the catio via a cat door through a wall in the house. The dog door is for the border collies to access the rest of the yard, which the cats don’t use. The builders used 1-by-3-inch livestock screening and rough-sawn redwood for the framing and catwalks. They added a trellis for the owner’s plants, which provide shade for the catio in the summer and attract hummingbirds. The catio took about two weeks to build, which included power washing the existing patio floor, as well as electrical work, painting and finish carpentry. Bears not welcome. 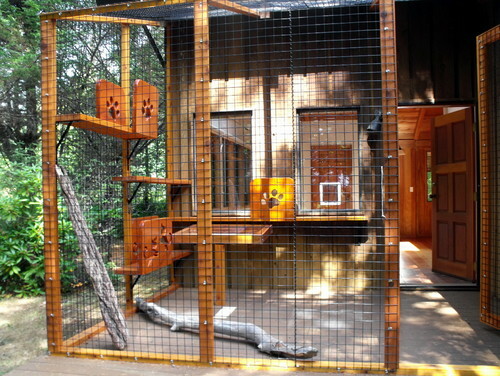 This catio on Canada’s Vancouver Island was built by Catscape, a division of Beautiful World Living Environments, which specializes in enclosures for animals ranging from dogs to ferrets, birds and rabbits. John Creviston of Beautiful World describes the enclosures as “people places that also contain cats.” The catio above is in a rural area near Victoria, and there’s a resident bear living nearby, Creviston says, so solid screening was vital. He prefers to use welded wire mesh with a vinyl coating. Using wire that is too thin runs the risk of damage from weather or predators. Tip: Use light colors and finishes for platforms exposed to the sun, which can become dangerously hot if the surface is dark-colored. For those who don’t want to design a catio themselves, there are companies that sell pre-designed catio kits, design plans or individual components. If you’re very handy with a hammer, you can build it yourself, or you can hire a carpenter. Some companies can recommend installers. Custom builder John Creviston warns that the price of a kit may seem reasonable, but costs rise when you add shipping and hire someone to install it. Portable playspace. Catio Spaces, based in Seattle, sells DIY plans for four catio designs, ranging from a window box to a four-sided enclosure with a tunnel. Each design plan has a downloadable PDF that includes a materials list, tools list and step-by-step instructions “that take the guesswork out of building a catio,” company founder Cynthia Chomos says. Shown above is the Sanctuary style, with the wood frame painted black. Chomos says her plans call for four-by-four pressure-treated horizontal wood frames with panels that screw on. The panels break down so they can be dismantled at a future date. See them yourself. Catio tours are now a thing. Chomos’ catios have been featured on a catio tour that visits 10 catios in the greater Seattle area. Other catio tours take place in Portland, Oregon, and Santa Cruz, California. The tours are usually sponsored in part by animal welfare groups and are meant to inform and educate the public about keeping cats and wildlife safe. Habitat Haven in Toronto sells pre-designed kits with all the parts included and also individual components such as stairs, towers, tunnels and bridges that fit together so you can design and build one yourself. Catio Designs sells DIY design plans that include the Luxor self-standing model; the Ritz, which is accessed via a door; Windows on the World, entered through a window; and the Petite Window, which extends out from a window like a greenhouse. Although it’s best to have a pro build a catio if you’re not skilled at carpentry, an experienced DIYer could tackle the project. 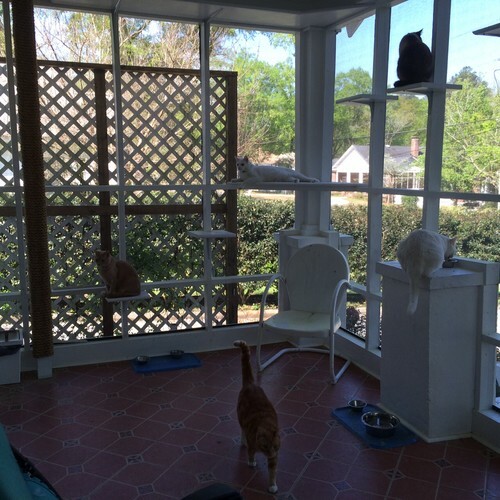 Here, kitty, kitty, kitty … The catio shown here was part of the renovation of a 1920s bungalow in South Carolina. Owners Aimee and Greg Talbot, who own an antiques company called EuroLuxHome,wanted to create a special space for their seven cats — including Minkey and Fozzy, shown at left lounging on their perches at sunset. The couple screened in an existing 11-by-17-foot porch, built walkways, steps, corner platforms and a sisal rope firefighter’s pole for the cats to climb on and use as a scratching post. They tiled the screened-in porch themselves with Mexican tile and used a vintage door, which they found at the Antique Tobacco Barn in Asheville, North Carolina. Fozzy surveys the scene from the highest cat shelf in the catio. Tip: DIY catio builders should first consider their home’s layout and sun orientation when designing a catio, Greg Reid of Plan A Architecture says. “Then try to create a structure that looks integrated with the house, and be sure to add elements that are beneficial to your cats.” The cats are supplied with cat grass, which they graze on all day, Aimee says. The couple installed two cat doors on either side of the front door. With multiple cats, she recommends installing several access doors since cats tend to be territorial. “We didn’t want one cat to hog the porch by not letting the others out the door,” she says. This article is part of a collaboration between Pets Best pet health insurance and Houzz. We’ve teamed up to provide you this series of articles focused on pets and homes. Learn more about pet insurance at petsbest.com.